We have separated the questions into two sections, on this page we are dealing with your frequently asked questions about our blinds, you can find the answers to our Awnings FAQ’s here. Q. How do I book a home visit to view your range of blinds? A. We are delighted you are interested in seeing our range of blinds, please call 01604 452791 or 07738 733319 and we can make an appointment for Martin to come and see you in your own home. Q. How much will it cost to get measured up for blinds? A. We don’t charge for measuring, it is all part of our service. Q. How much do you charge to fit the blinds, do you have an hourly rate? A. We don’t charge for fitting either, the entire service is free, all you pay for is the blinds! Q. How much will a new blind cost? A. It is very hard for us to give you an accurate price without knowing what type of blind; we sell Venetian blinds, vertical blinds, Roman blinds, wooden blinds, metal blinds, pleated blinds or roller blinds. Also we would need to know the colour & size of the blinds, not to mention if you require any accessories. To give you an indication our prices start from £48. A. We conduct a home consultation visit, free measuring and fitting service for our Blinds throughout Northamptonshire, from Towcester to Corby! Q. What types of blinds can you show me? A. We have a variety of blind samples in our van, if you have a specific type in mind do let us know when you make your home consultation but we generally carry a nice selection which can include Roman Blinds, Vertical Blinds, Wooden Venetian Blinds, Metal Venetian Blinds, Pleated Blinds, Photo Blinds, Roller Blinds and a couple of specialist blinds as well. Q. How long will it take for my blinds to arrive? A. Usually the whole process from the home consultation, Measuring, ordering through to fitting takes about 2 weeks. If you need an express service, have a chat with Martin and we will see what we can do. Please bear in mind the photo blinds will take longer due to the printing processes. Q. Are you part of a franchise or a big group? A. No, we are a local family run business. We pride ourselves on our personal service, making sure each of our clients are fully satisfied with our blinds service. You can check our testimonials here. A. We don’t have a big expensive showroom or shop, we prefer a far more personal service. Besides without large overheads we are able to pass on these savings to you the customer. 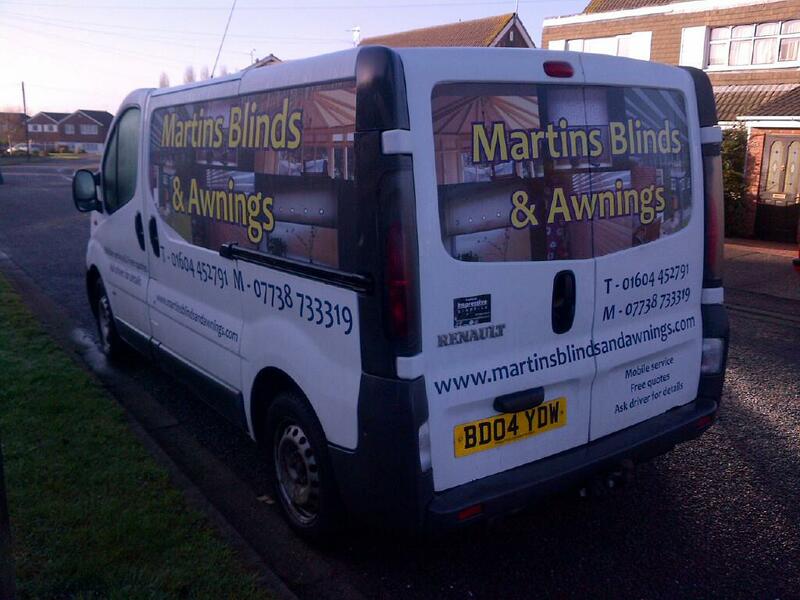 We carry all the blind samples in our specially branded van for you to view in the comfort of your own home. Q. What if we get a problem with your blinds? A. It is unlikely you will encounter a problem with our blinds as we only supply highly quality, well manufactured products, but if you do we are there for you! All our blinds are manufactured in The UK and so we are able to deal with any issue, promptly and efficiently.